Mortgage Power – An Asset in the Making takes you on a journey through the mortgage world, showing you how to convert your mortgage—often your biggest liability—into what can become your biggest asset, and why you must do it for your financial future. Mortgage Power – An Asset in the Making not only presents the underlying theory behind its premise of modifying a mortgage to create wealth, but it also gives you real-world examples, with numbers that add up to prove the astounding benefits of proactively managing a mortgage. The book is revolutionary in how it teaches us to think differently than our parents and grandparents did about home ownership and mortgages. 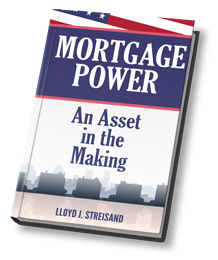 In layman’s terms, Mortgage Power – An Asset in the Making shows you how to manage and modify your mortgage, and in so doing how to create tremendous wealth and prosperity from something as basic as a mortgage. By making simple changes to your biggest liability, you can tap into tremendous wealth and ultimately create an asset that will provide you benefits long into your retirement—benefits that would otherwise not be available to you. Mortgage Power – An Asset in the Making reveals how to buy a home with a limited down payment, how to build your mortgage team, how to navigate the mortgage process, why you should own and not rent, and why you should avoid a 30-year fixed rate mortgage like the plague.